This is our basement playroom. This is also the room with the old fireplace insert and all my fabric on shelves. We bought an IKEA futon when we moved in and I would haphazardly cover it with quilts to try and combat our cat hair issue, since our cranky old cats have staked out this room as their particular habitat. I had a cheap butterfly chair in the corner and we tossed toys into plastic bins. It was fine, blah, a basement playroom. Last year we did most of our homeschool lessons down there, but this year we’re more likely to camp out with our stack of books and manipulatives in whichever part of the house seems most appealing on a given morning, so this room is really used exclusively for playing and crafting. Unfortunately this room also used to flood in heavy rains, which meant that our train table (not pictured) had yogurt cups around the legs, we couldn’t have a rug, and all the storage and furniture had to be made of water-resistant materials. Ugh. 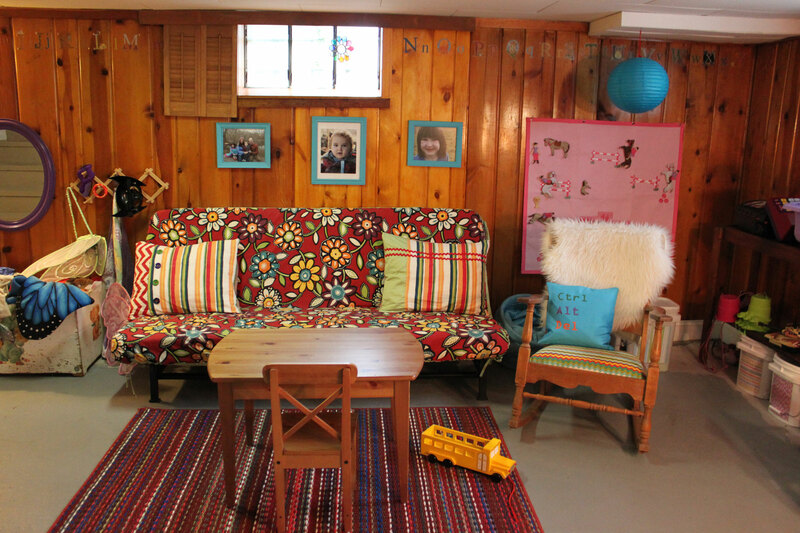 This fall, however, we had our basement waterproofed and I decided to improve on our newly dried-out space. I found a sweet vintage toy box to store the dress-up things, an old comfy rocking chair, and an inexpensive rug. I recovered the seat on the rocker and I sewed a new cover and pillows for the futon out of sturdy indoor/outdoor fabric that stands up nicely to the cat wear. A set of old wooden shelves became easy toy storage. 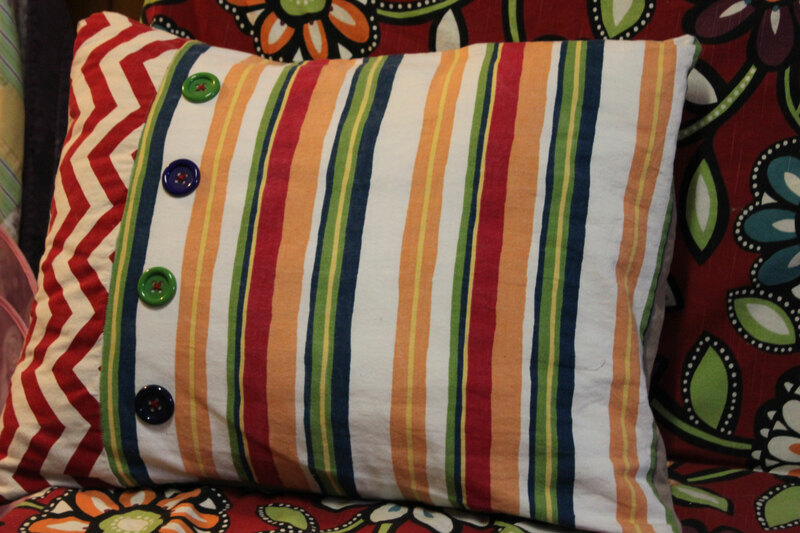 The pillow covers have overlapping back panels so they stay on well but also come off easily for washing. 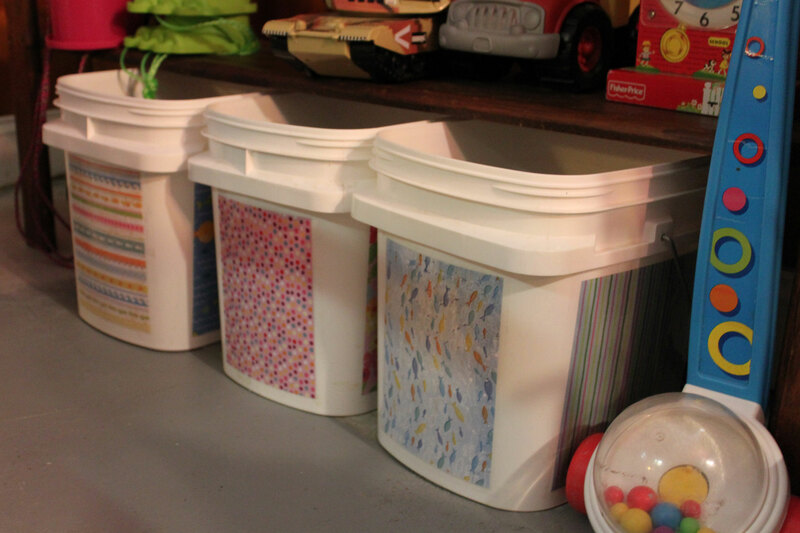 I dressed up more old kitty litter tubs with scrapbook paper covered with contact paper to store small toys such as balls, matchbox cars, and little people. 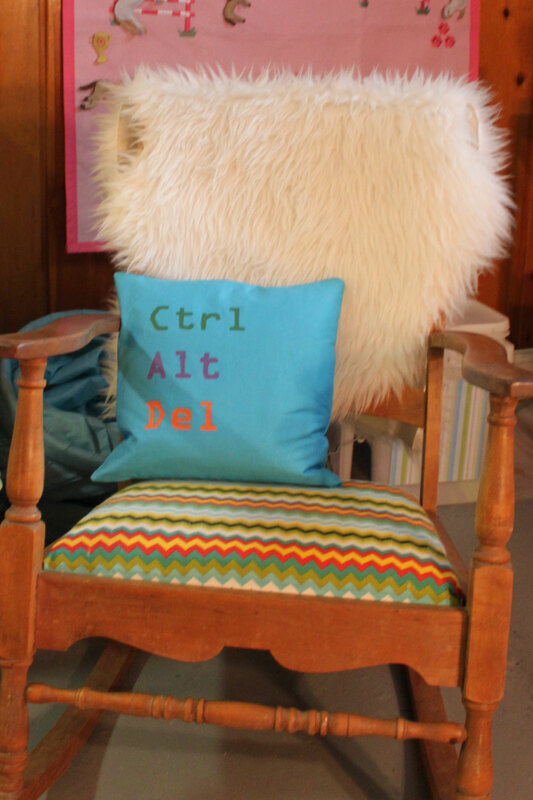 Now the whole family gets more (and more pleasant) use of our playroom space. It has a cozy cabin feel with the fireplace and the old pine walls. We appreciated it fully earlier this week when we spent part of the night down there, listening to tornado sirens howl outside!